2-room apartment 70 m2 on 1st floor. Practical and cosy furnishings: 1 room, ceiling height 190 - 200 cm with 1 double bed (2 x 90 cm, length 200 cm), cable TV (flat screen). Exit to the balcony. 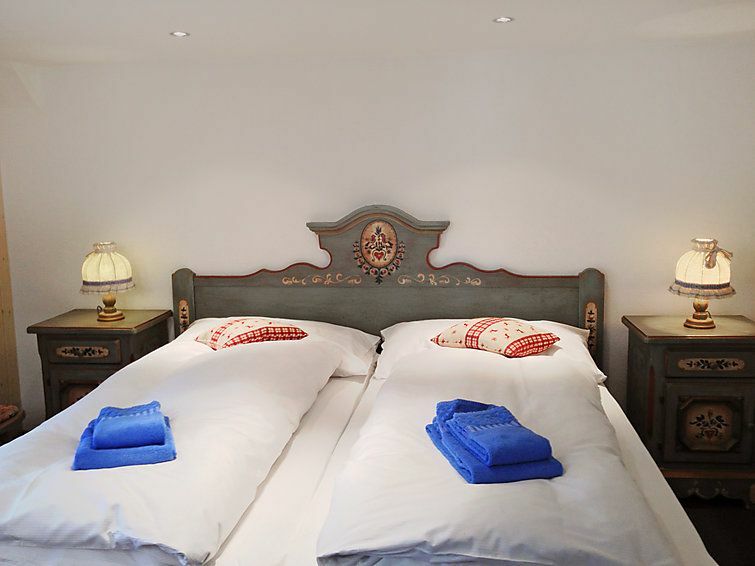 1 room with 1 double bed (2 x 90 cm, length 200 cm). Kitchen-/living room (oven, electric coffee machine). Shower/WC. Balcony, south facing position. Balcony furniture. Marvellous view of the mountains. Facilities: Internet (WiFi, free). Reserved parking at the house. Please note: apartment street side. Non-smokers only. Maximum 1 pet/ dog allowed. Fire extinguisher. Leider beträgt die Raumhöhe nur 1,95 m. Für mich mit 1,95 nicht so gut. Man sollte wissen, daß es keine Geschirrspülmaschine und keine Sessel oder Sofa gibt. Ruhig Sauber wir waren selbst Verpfleger gerne wieder.